cyberREN recognizes laboratory results as one of the single most important tools available to real care providers in the diagnoses and management of renal patients. cyberREN offers an entire suite of laboratory data processing functions in order to make results available to caregivers quickly, and present them effectively in diagnosis and care planning tasks. Registration - cyberREN provides a comprehensive, flexible HL7 interfaces for the automatic registration of laboratory results. cyberREN can easily handle multiple data sources, mapping divergent representations and nomenclature into a single system. The manual entry of laboratory results is also supported, with flexible forms designed for such input. 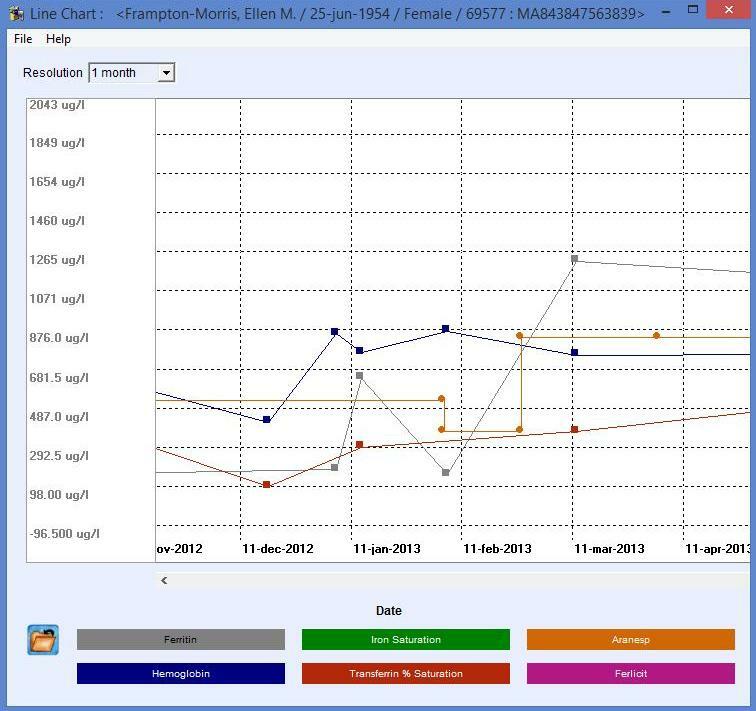 Presentation of laboratory results is in three formats: Tabular Chronological, Flowsheet and Graphical Trends. Flowsheets are user definable and may contain only laboratory results but may also be combined with other numerical data from the medical record, such as medication dosages, weights and blood pressures. Graphical Trends may be derived directly from Flowsheets and show up to six sets of numerical data contained in the flowsheet on a time access. Abnormal results are alarmed in several ways, in general by highlighting results by color. Laboratory result limits may be defined uniquely for individual patients, overriding the standard alarm limits, which can also be modified by authorized cyberREN users. Laboratory results are automatically presented strategically in selected chart sections, such as patient encounter charting, office practice visit charting, medications ordering and patient care planning (Care Plan). cyberREN performs automatic calculations during the results import process, deriving such important parameters such as protein catabolic rate, urea reduction ratio and KT/V, by using hemodialysis treatment data and other patient physical attributes. Rates of change are also automatically calculated, and cyberREN can alarm caregivers of excessive rates of change even if the result has not yet reached a critical limit.